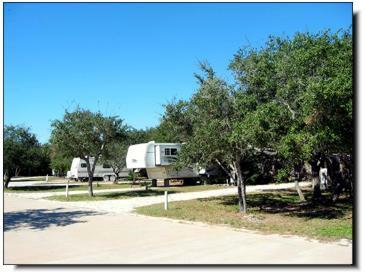 Buffalo Park is a small RV park located nestled in the trees on the outskirts of Rockport, Texas. We offer 50 full hookups, a new clubhouse, shower/restroom facilities with laundry mat. Our services include cable tv, individual meters (30 and 50 amp service), a cement drive as well as onsite RV/Boat and miscellaneous storage facilities. Located near the bays, restaurants and other area attractions in Rockport, we have a manager on site. Our park is safe and secure with no thru traffic. With our location on the outskirts of Rockport, we are a tree lovers paradise with 36 acres of hiking, a nature trail and dog walk area. You will find our rates are very competitive with daily, weekly, monthly or yearly rentals offered. CPL rates are available for annual hookups. Feel free to call or email and let us know how we can assist you! Come home to Buffalo Park. You'll be glad you stayed!